Big F%*#ing Robots are super sonic death machines sent from the past to distort the future. With a plethora of bass powered music at their fingertips and an appetite for all that is nasty and fun, they are sure to reprogram a crowd and get their limbs moving. With a head full of LEDs, the Robots have gained a reputation for their high energy performances and have DJ’d at festivals around Victoria and southern NSW including: Earthcore (The Brink theme camp), Burning Seed, Rainbow Serpent Festival (Wungacillin theme camp), Samsara, Cooinda, BFG Sound System’s Fo shizzle, Creatures of the Night, Off the Richter, Cybertronic 2050 and more.. In addition to many Melbourne underground outdoor parties and club events. 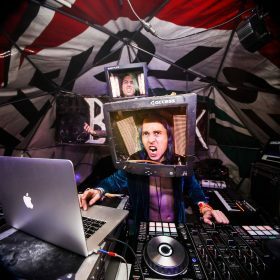 Not content with only DJ’ing they also produce and self release their own quirky but exciting music ranging from neuro-hop to face melting electro-house. They’re also currently working on a Drum’n’bass EP with fellow Australian producer Vortek.